I'm not gonna say a thing. I'm gonna leave it to you to come up with an appropriate caption. We'll see you Saturday with the results. In the meantime drop by Screaming MeMe's place for her weekly caption contest. Scientists have developed a new strain of aggressive plastic supermarket bags that are even MORE dangerous to kids. Maria's yard sale went extremely well on Saturday. 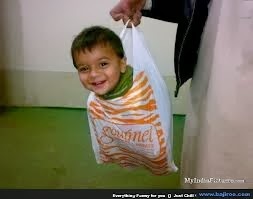 "I couldn't help myself -- they had such a good deal on fresh kids at the supermarket today!" At the checkout, Marge chose the appropriate bag when asked, "Paper or Plastic?". Kyle decisively misunderstood when his mom told him to take out the trash. Boom Boom demonstrates her mad skills at keeping preschoolers out of trouble day after day. Anne Geddes fired her biographer for releasing her first whimsical baby photo to the tabloids. No. no. no. I said, A container of milk, a loaf of bread, and a stick of BUTTER.